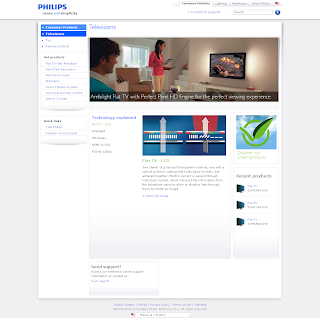 PHILIPS is a company that sells electronic stuff like television, audio products, lighting and many other electric products. 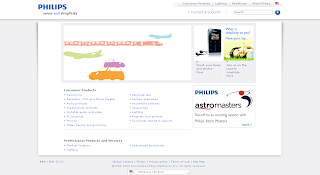 In this website they give lots of information to customer about their products. Even though they have wide range of products, it's still easy for user to search for the products that they want because they already categorized all information into their own categories. There also search engine to make it even easier. Not only that, there also the company information about their history, company profile, design, research, etc for other user that want find other information beside the products. For the structure this website have the same main structure for all website, there always the same header and footer, only a bit difference in content area that mainly divided into two parts. In main page the content area divided into two parts, in right side we can see list of products categories while in left side there's image links that featuring their featured products. In the product area (eq. 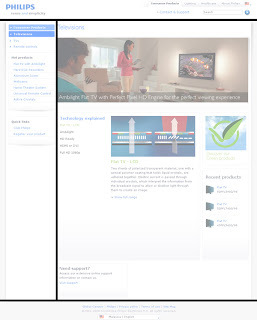 television) in the content area the right side consist of more sub-pages links for television categories, while in the left side there's a bit information about their feature products that if we click will bring us to more specific page and the most recent products that PHILIPS produced. 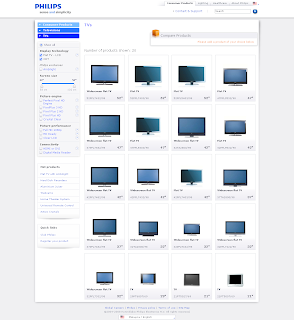 In more specific page like in flat TV page, user can easily find the TV they want by using the left side navigation to put specific criteria of products that they want. I think it's so effective so user don't need to see all products information one by one but just directly put specifically the product criteria that they want. Overall the website quite clean and easy to navigate, there's some image links for featured products so user will more interested in clicking those image links.